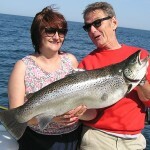 Lake Ontario Trout and Salmon Fishing Charters…, Why do Captains Hate Vibram Soles? 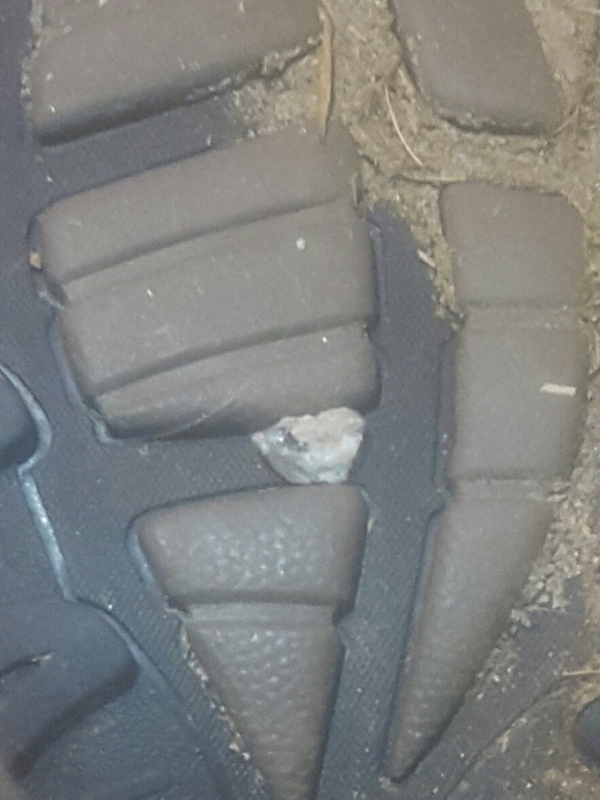 A small stone like this jammed in a cleated sole will cause major damage to the deck of a boat. If you’re a charter captain or, worse yet, a mate on a charter fishing boat, you do not need to read this. You already know the answer to the question! However, if you are one of hundreds of thousands of anglers who fish aboard a charter boat and think that the Vibram soled boots you wear for hiking, hunting, logging, doing construction work, or whatever are “the nuts” for fishing, please read on. If you want to immediately wear out your welcome on a charter boat, just step aboard with Vibram or cleated soled boots or shoes…, bad way to start your trip! Why is that? Well, there are two main reasons, safety and the potential damage to the boat deck. Why safety? Answer…, as far as I know, there is nothing as slippery on a wet fiberglass or teak deck than hard, cleated soled shoes or boots. 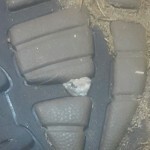 If you have ever stepped on glare ice with Vibram type soles, you know exactly what I mean. All captains are concerned about safety of their passengers and none of them want to see a charter customer injure themselves by slipping and falling. It’s tough enough to stay on your feet on a wet, slippery, slimy deck in flat water, but in rough seas it’s worse. I’ll never forget one of the first charter trips of the season I, after spending several thousand dollars the winter before on a new fiberglass floor in my cabin and cockpit. An unknowing angler climbed aboard wearing Vibram soled hiking boots. Rather than say anything, I sucked it in, thinking, “Oh, well.” After a busy trip with 5 anglers aboard my crew for the morning had departed, and it was time to swab the deck. When I looked down, my jaw dropped. The brand new and very expensive floor was covered with deep gouges. Any comfortable shoe or boot with soft, uncleated soles that don’t leave scuff marks are the way to go. A lunker brown boated on a 6' Fish Doctor Short Stick and 10# line. If you’re in the market for a new line counter reel, take my advice and check out ABU Garcia’s new Altum digital line counters. I fished the Altum 20, largest of the Altum series, with 30# mono on rigger rods for salmon last season, and it never skipped a beat. My thoughts…, smooth as a Swiss watch and built like a tank! It has features currently unavailable in any other line counter reel. It is programmable for different line diameter, has a large digital display, has a lighted display at the push of a button, and resets to zero, if necessary, with a push of a button. These aged old eyes really appreciated the large digital readout, and especially liked the lighted readout in low light at dawn and dusk. Altum reels also have ABU Garcia’s Synchro feature found in their 7000 Synchro which has not been available in the U.S. and also the Alphamar 16 and 20 series. I’ve used the 7000 Synchro for 1o or so years and the Alphamar 20 for 4 or 5 years. They, along with the Altum 20 are the nicest reels I’ve ever fished on rigger rods and wire rods. Here’s the deal with the Synchro feature…, crank the reel handle backward 1/4 turn and it lightens the drag, perfect for setting riggers. Rig your line in the release, crank the Synchro handle back and it lightens the drag just enough to maintain a bend in the rod as your rigger weight descends. When the rigger stops, flip the free spool lever and you are good to go. If you need a bit more tension on your drag to maintain the proper bend/tension in your rigger rod don’t crank the handle back quite as far. The 1/4 revolution in the reel handle controls the drag tension. As you already guessed, this feature is perfect for setting wire/braid/mono Dipsys. Place your diver in the water, adjust the tension on the rod tip by cranking the reel handle back to the proper drag tension and walk away as the Dipsy descends into the depths. For the upcoming season, I just spooled up 10 Altum 12s, smallest of the Altum series, with 10# hi-vis Trilene/Berkley Solar mono on ultralight planer board and rigger rods. Line capacity is 320 yds of 12# mono. The Altums replace my Garcia 5500 LCs, which hold 205 yds. of 12# mono. When someone finally hooks that monster brown on ultralight gear, there isn’t anything much worse than looking down at an empty spool with almost no line left on it. The extra 100 yds. of mono on the new Altum 12 brown trout reels will be a welcome “cushion” this season. Since, 2004, when I wrote the first Great Lakes Angler article on fishing copper in the Great Lakes this technique has become widespread from Lake Superior to Lake Ontario. Age old, copper line has been used for years by lake trout trollers to “jerk line” lakers off the bottom in Adirondack lakes like Lake George and the Finger Lakes in central New York. Today’s Great Lakes copper line trolling techniques are a mix of the old and the new. The basics are the same, but the application is different. Next season, you guessed it, on the VHF I heard the second captain, “Just took a nice king on 500’ of copper!” Choking on my coffee, I realized a person can’t laugh and drink a cup of coffee at the same time. Yes, trolling copper has caught on in the Great Lakes. Today, there are many experts(?) who troll copper, publish videos on how to do it, give seminars on the subject, etc., etc. The basics are pretty straight forward, but one thing many do not agree on is the length of leader that should be fished on copper. Let’s take a look at this. Although I started fishing .037 diam. twisted copper line for lakers with no backing on a Penn Mariner reel and 6’ rod with roller guides back in 1968 and have fished copper in Lake Ontario since 1978, I don’t pretend to be an expert. However, I can tell you what leader lengths have caught fish for me for 49 years. When I first started fishing copper line I used a rod with roller guides, not realizing standard guides with ceramic inserts worked fine for copper. So, with a roller tip on the guide, the barrel swivels available at the time for joining copper to monofilament leader would not pass through the roller tip. That limited leader length to 6 feet, 30# test at the time. Six foot leaders caught lake trout in Lake George and trout and an occasional king salmon in Lake Ontario. I say “occasional”, because very few of the kings that hit the spoons I trolled every came to the net. There was a major drawback with 6’ of 30# mono leader…, lack of stretch or shock absorption! I was fishing large flutter spoons with #4/0 single hooks and king salmon hammered them. However, it did not take long to learn, after a few savage strikes using a stiff 6’ roller rod and a 6’ leader, that there was not a 4/0 Siwash hook on the planet that wouldn’t straighten on the strike, unless you got lucky. The next step in copper evolution aboard the Fish Doctor was a switch to a 9’, moderate action rolling rod, still with a 6 – 8 ft. leader. The longer, softer rod helped absorb some strike shock and a few more kings came to the boat. Next step…, witching to standard Fuji Hardloy guides on 9’ rods and using the then newly available Spro #3 Heavy swivels. This was a huge step forward, because the copper/leader connection would now pass easily though line guides and levelwinds, allowing the use of longer, stretchy leaders which solved the “strike shock” problem. Once the system evolved to effective copper reels and rods with ample backing and unlimited leader length, my focus switched to the question…, “How much leader?”. It made sense to use leaders that were effective, yet efficient. Efficient as possible meant getting lines in the water and fish in the boat quickly, i.e., quicker out and quicker in, the shorter the better. Effective as possible meant using whatever leader length it took to generate the most strikes and hook and land the most kings, no matter how long the leader had to be. After fishing with some of the best captains on Lake Michigan who used 100’, 20# mono leaders on leadcore, I tried the 100’ leaders. They caught kings with spoons, dodger/flies, and flasher/flies and generated as many hits on copper as any leader length I have ever used. But, it takes time to put 100’ of leader in the water. Ditto for landing fish on long leaders. Were 100’ leaders necessary? Could I fish heavier than 20# leaders, especially late in the season with attractor/flies? That’s when I started experimenting. Fishing up to 7 copper rods at once, there was plenty of opportunity for testing. To keep it simple, and knowing I needed the benefit of some stretch to avoid “strike shock”, I eventually settled on trying leader lengths of 30’, 50’, 75’, and 100’. What I learned was that effective leader lengths for spoons and attractor/flies differ. Trolling spoons, there did not seem to be much difference in the effectiveness of leaders once they exceeded 50’. Trolling spoons on less than 50’ of leader seemed to be less effective. There also did not seem to be any difference in fishing 50’ of 20# leader with a spoon or fishing spoons on 50’ of 30# leader plus an 8’ 20# leader. Because of the durability of the 30# leader, I settled on the latter, using 8’ of lighter leader to enhance spoon action/effectiveness. Trolling attractor/flies, I found no difference between 20# and 30# leader, and opted for the more durable 30#. I also found that 30’ of leader was as effective as longer leaders. However, I compromised and decided to use 50’ of 30# leader for attractor/flies, so the same leader could be used for fishing spoons. Spoons – 50’ of 30# leader plus 8’ of 20# leader. With up to 6 copper lines at a time fishing from boards, plus another down the chute, using the same 50’ length of 30# leader on every rod makes my life simple, and simple catches fish! The undisputable fact is, though, that I’ve never generated more strikes and caught more fish than when fishing spoons and attractor flies on 100’ of 20# leader. Common sense tells me there is no way that much leader is necessary, but “if it ain’t broke, don’t fix it!” In my case, though, as a charter captain, a shorter 50’ leader is a practical compromise of efficiency, effectiveness, and durability. Yours truly tends to be a bit verbose in the winter when time is more available than during the 24-7 charter fishing season. Sooo…, with charter customers asking, “What do you think fishing will be like this season?”, let’s take a short and sweet look at this by species ranked 1 to 10. King Salmon – 8-10 But, this depends on when kings show up in Oswego. If we start catching them in late April or early May like some years…, 10. King salmon fishing in 2018…, I’ll give it an 8 overall with some outstanding fishing in late, June near shore and offshore in July and early August. Spring Cohos – 5 Some years we catch decent numbers of spring cohos well into June, but other years nomadic leave Oswego in late April and early May. The word is…, unpredictable. Late Summer Cohos – 7 Not so with late season cohos that always show upin eastern Lake Ontari9o in late August and provide decent fishing until the run the Salmon River in late September. Late summer coho fishing in 2017…, 8. 2018…, ? 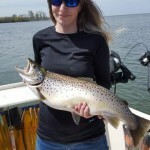 Brown Trout – 10 Look for exceptional spring/ summer fishing for larger than average browns. We caught more yearling browns in 2017 while fishing for browns and cohos than I’ve seen in years. 2-year olds were plentiful and larger than normal in the spring and summer harvest was down because all the attention was focused on kings. Expect plenty of 2-year olds and some jumbo 3-year olds, along with the occasional monster. 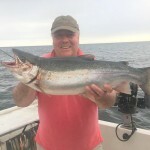 Lake Trout(April 1 – June 1) – 10 Every spring just outside Oswego Harbor lake trout fishing is as good as it gets, but lakers leave the Oswego area in late spring. Summer lake trout fishing out of Oswego is almost nonexistent. If you want summer lakers, head north to Stony Point. Steelhead - ??? Excellent in June the past few years, including 2017. Fishing in July and August 2017 was better than normal because we were fishing kings way offshore in “steelhead country”! Steelhead fishing is all about conditions, but in mid to late summer, you can always find them offshore. Domestic Rainbows – ??? Normally caught incidental to brown trout and salmon fishing, domestics were more abundant and larger than normal in 2017. Where most domestic rainbows are still less than the legal 21″ limit by early May, domestics were averaging 22-23 inches at that time in 2017. Dandy bonus fish. Atlantic Salmon – 1! We see very few trophy Atantics each season, but they are spectacular! Oswego brown trout, April, 2017. If you live in northern New York or New England where winters are long and cold and spring arrives oh, so slowly, it’s hard to believe what a difference there is in spring weather along the New York shoreline of Lake Ontario. So it was when I answered the phone one early April evening. “Hi captain Ernie!”, I heard holding the phone to my ear. It was Phil, a long time customer from the Adirondack mountains in northern New York. After some “hellos” and “How are yas”, he said, “Just wanted to call and reschedule our April 10th trip.” “Why is that, I asked?” “Because of the snow and ice.”, he replied. “What ice and snow?”, I questioned. With northern Adirondack lakes still frozen solid and two feet of snow in Phil’s front yard, it was hard for Phil to believe I was looking at bare ground and had been catching brown trout, coho salmon, lake trout and a few rainbows in Lake Ontario out of Oswego Harbor since April 2nd. Spring comes much earlier to the south shore of Lake Ontario than parts north. Up to 20,000 cfs of Oswego River runoff flowing into the lake flushes ice cover from Oswego Harbor and it’s marina. With a 5,090 square mile watershed draining snow free central New York and the rich farm land of the eastern Finger Lakes, the nutrient laden early spring flow warms quickly, a huge attraction to baitfish and trout and salmon as it enters t icy Lake Ontario, which seldom freezes over. Quality and diversity best describe Oswego’s spring charter fishery. 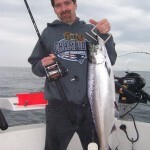 Charter fishing starts as soon as the marinas are ice free, usually some time from late March to no later than midApril. Even in the spring of 20q15, after one of the coldest winters on record, I launched my charter boat on April 10th. As soon as marinas inside the lower harbor are ice free, most most charters target near shore brown trout. Spring coho salmon may also be abundant in late March and early April. 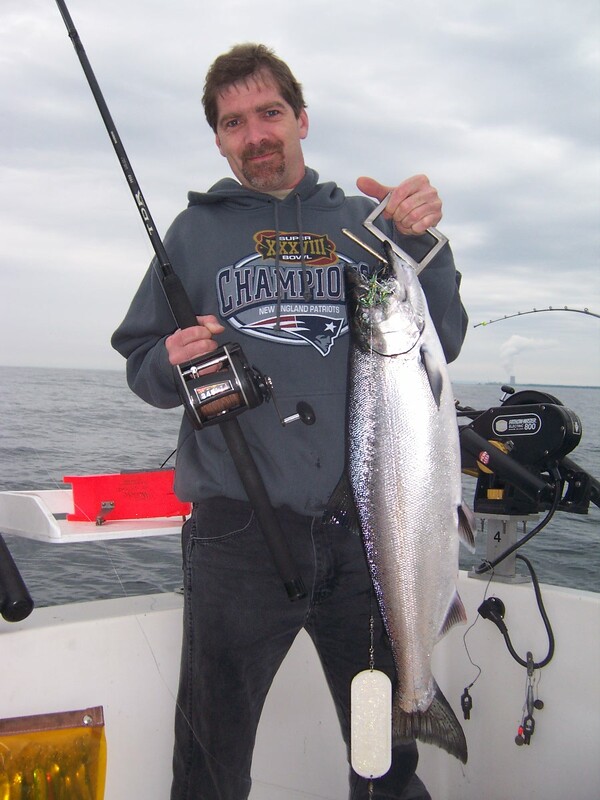 Lake trout, rainbow trout, and Atlantic salmon are also caught on fishing charter trips trolling the shoreline. Browns remain inshore in shallow water until around midJune when water temperature reaches the mid60s in the shallows. Although often overlooked in early April some of the best lake trout fishing of the season is in deeper water where lakers stack up on bottom. A diet of wintering alewives produces heavy bellied togue, the largest to date from Lake Ontario, 39 lbs. 8 oz. 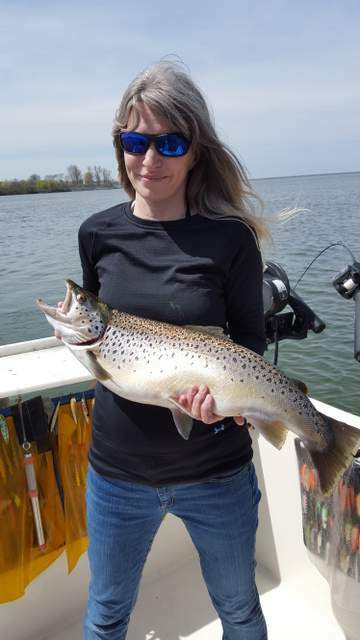 By late April, brown trout fishing continues and lake trout move closer inshore. Coho salmon usually head west out of the area by late April and early may when king salmon move in, attracted to the bait filled plume of the Oswego River. In recent seasons, kings have arrived off the mouth of Oswego Harbor as early as April 13 in 2012 and as late as May in 2016. 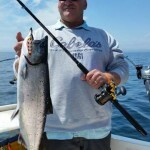 King salmon fishing in May is fair to outstanding depending on conditions, and salmon fishing continues throughout spring. IN one of the best spring salmon season I recall, my anglers boated 201 kings in 31 trips in May. Spring steelhead fishing, year in and year out, is usually best in June, as it was in the last half of June, 2016. 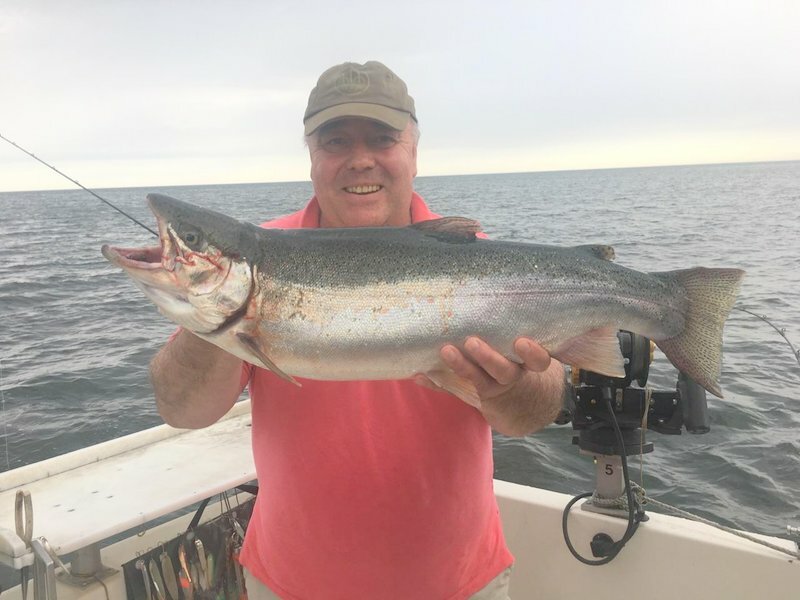 Steelhead are usually found well offshore, but in 2016, along with large numbers of king salmon, steelhead followed spawning alewives inshore and were easily accessible, just minutes from the mouth of Oswego Harbor, a fishing bonanza. 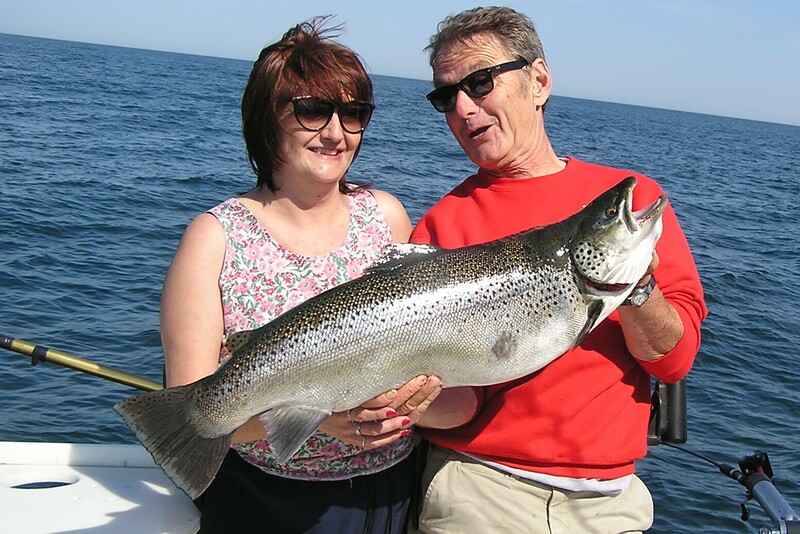 No matter how you cut it, because of the influence of the Oswego River, Lake Ontario’s second largest tributary, the quality and diversity of spring trout and salmon charter fishing in Lake Ontario out of the port of Oswego is tough to beat. Whether you’re new to trolling twisted copper line for trout and salmon or have fished with it since 1968 like I have, a constant concern is the depth at which it presents a lure. This depends on the weight or diameter of the line you’re fishing and the speed at which you are trolling. My rule of thumb after fishing .037 diam. (45#)copper on bottom for 50 years is…, at a trolling speed of 2.7 mph every 100 feet of copper fishes down 22’. Pick up your speed and copper fishes shallower, slow your speed down and copper sinks like a stone, fishing deeper. Fish lighter, smaller diameter copper, and it fishes shallower. But what about the speeds above and below 2.7 mph, and what about copper smaller in diameter than .o37? The following depth chart by Blood Run Tackle compares the sink rate of 30# and 45# twisted copper line at 2.0, 2.5, and 3.0 mph. It clearly shows the difference in depth both sizes of copper line fish at different speeds, with an estimate that 30# copper fishes at 2/3rds the depth of 45# copper, i.e. with 300’ of copper in the water, 30# fishes a spoon down 56 feet while 45# reaches a depth of 84’. That’s the story when fishing spoons, but in my experience the depth fished with diving plugs and attractor/flies, especially dodger/flies or large flashers, varies slightly, especially on longer, 50’ to 100’ leaders. Diving plugs like a #4 j-plug will fish about 5’ deeper on 100’of leaeder. Dodger/flies fish shallower, but your guess is as good as mine about how much shallower. Back in 1968, when Lake George guide Doug Canaday showed me how to fish .037 diameter twisted copper for lake trout, rigging it was no big deal. 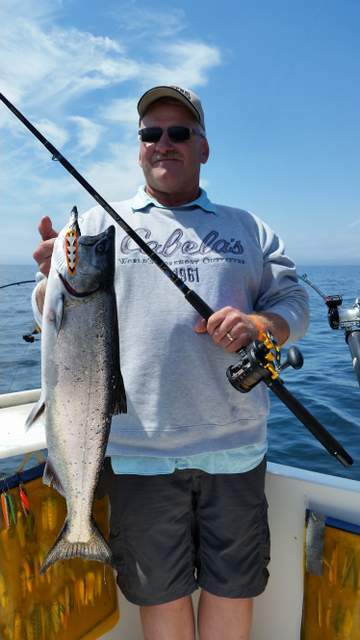 Because the 30# monofilament leader Doug used for lakers was only 6’ long, he didn’t have to worry about the leader to copper connection sliding thru the guides on the 6’ trolling rod he was using and a large barrel swivel connecting leader to copper sufficed. With the Penn Mariner reel he used with no level wind, neither did he have to worry about the barrel swivel passing freely thru the level wind. Since no backing was necessary for lake trout fishing, there was no concern about a backing to copper connection. That all changed when Doug’s copper technique evolved over the next 50 years to the one I use today with leaders up to 100’, Penn levelwind reels, and up to 600 feet of 50# braided backing to keep feisty king salmon from “hitting the end of the chain”! With this system, the copper to leader and copper to backing connections must pass freely thru both guides and levelwinds. If not, at best, connections that hang up are a nuisance, and, at worst, they either make it impossible to fish efficiently or cost you big, strong, drag screeching trout and salmon. Many anglers, mostly for convenience sake, use a variety of knots to connect copper to leaders and backing, but I have never found any of these to be foolproof and none of them pass thru guides and levelwinds smoothly, As a result, after doing some research and testing, I settled on #3 Spro Heavy Swivels, which I have used since I found them, probably 15 years or more ago. #3 Spro Heavy Swivels test 150 lbs. and are small enough to pass smoothly thru level winds on the Penn GTI and Penn Fathom reels I use and thru theoversized ceramic guides on my 7’ custom Fish Doctor Coppersticks. 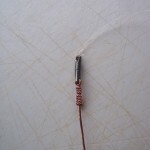 Mono leader is tied to one end of the swivel using a Trilene knot. 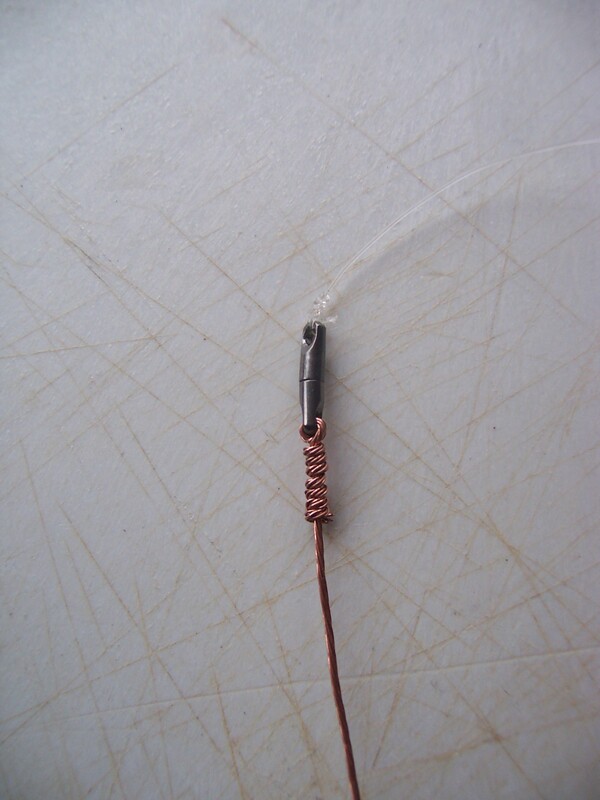 Then the end of the copper is twisted as much as possible, passed thru the end of the swivel once, then again, pulling the loop of the copper as firmly as possible onto the eye of the swivel The copper line extending from the end of the swivel is thn cut leaving about 2” extending from the eye of the swivel. The last step is to wrap the 2” end of thedopper as tightly as possible back onto the main copper line.